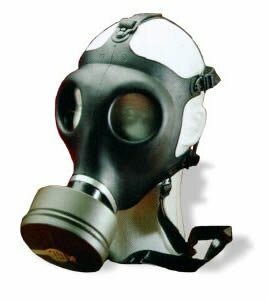 This is the gas mask issued to Israeli civilians when threatened with chemical attack by Saddam’s Iraq. It has full NBC (neuclear, biological, chemical) protection, and comes with one sealed filter. Mask is new, unissued cond. and has hydration port (comes with drinking straw but not canteen cap) Also good to have around for protection against smoke, paint spray, grinding dust, etc. These are the same masks that some were selling for $200-300 after 9/11. Note; U.S. sales only, no export. Please note that since we have no means of testing, or data from Israeli manufacturer, we cannot guaranty degree of protection, against all possible sources of contamination, or how long filter will last under various conditions (denser contamination means less time). we can only guaranty that mask and filter are in new cond.